According to the Corps of Engineers, Brushy Creek Campground and Johnson Creek Campground will be closing for the winter to both Camping and RV’s. The Corps reports budget cuts and storm damage and the cause for the closings. Brushy Creek was heavily damaged during a storm in March of 2018. Significant repairs are needed to repair the campground. The Corps of Engineers will keep Brushy Creek closed through the 2019 budget year. The Marshall News Messenger wrote in their October 3rd 2018 issue, “Due to significant repairs required related to the 2018 storm event at Brushy Creek Campground and the unavailability of funding to make needed repairs, the campground portion of the park is scheduled to remain closed for fiscal year 2019,” officials said. Recently is was announced that the Johnson Creek Campground will be closed to camping and RV use starting November 12th through February 28th 2019. This is the first time that this Lake O’ the Pines Camping area will close for the winter. Crappie Fishing is outstanding during the winter months and these closings will cause some visitors scrambling to find accommodations. Places to Stay on Lake O’ the Pines. The Lake O’ the Pines Chamber of Commerce has several members who provide accommodations. 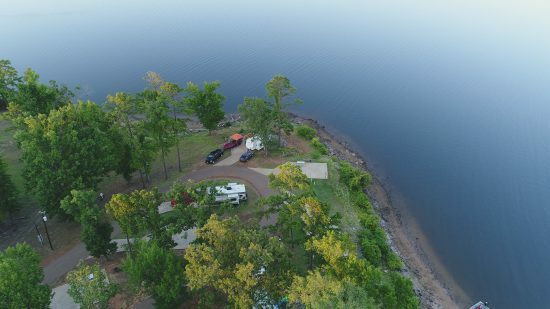 You can find out here; Places to Stay on Lake O’ the Pines . Winter is an awesome time to visit Lake O’ the Pines. The Crappie Fishing is phenomenal during December, January and February and historic Jefferson has numerous events during the winter months. Contact us if you have any questions.